Forensiq protects against high risk traffic sources and provides real-time predictive quality scoring for each visitor action. With the industry's largest fraud intelligence database, Forensiq offers incredibly effective solutions to fight affiliate fraud, cookie stuffing, click fraud, and display fraud. Our integration with Forensiq allows you to see click, conversion and lead scores in real time. You also have advanced rules and invalidation settings to send fraudulent traffic away from an Offer or Campaign in real time. 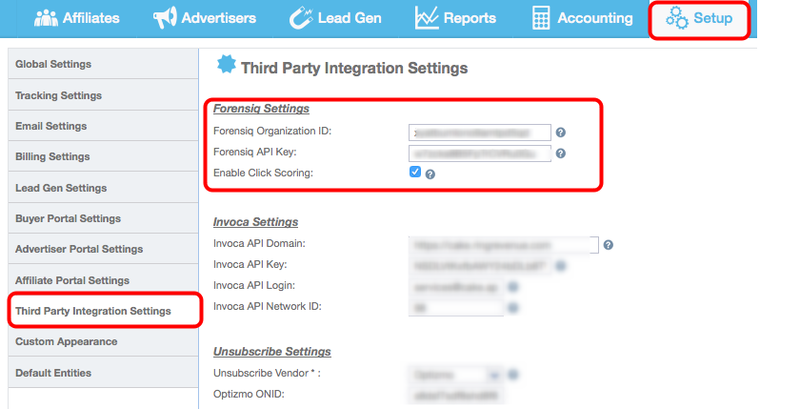 On the Settings page, please add your 1) Forensiq Org ID and 2) API Key and click Save. If you haven't already, you will need to activate the Global Pixel feature by ticking the 'Global Pixel' option in Setup>Settings> Tracking Settings - Global Pixels & Postbacks. The “rt” parameter must be set to “action” value (if this was already implemented, it probably said &rt=3_clickJS or &rt=0_clickJS). The “org” parameter must be set when you place the pixel – so, replace Forensiq CPAD_ORG_ID with your Forensiq Org ID. 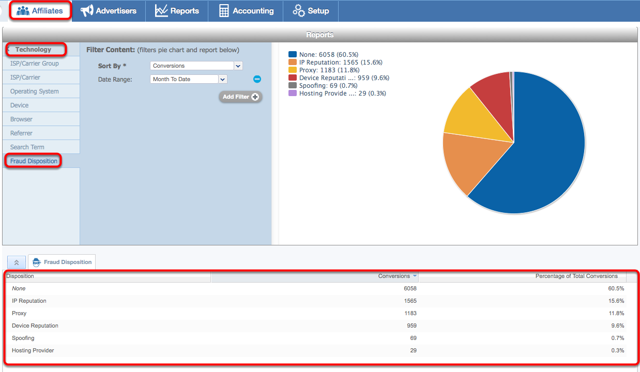 Once you save those settings, the feature is now available in your conversion report. When a Conversion Occurs that is scored at or above the Conversion Invalidation Threshold, we utilize the Offer Level configuration for ‘Conversion Behavior on Redirect’ and fall back to this same setting at the Global level. Reporting follows the same patterns established above. 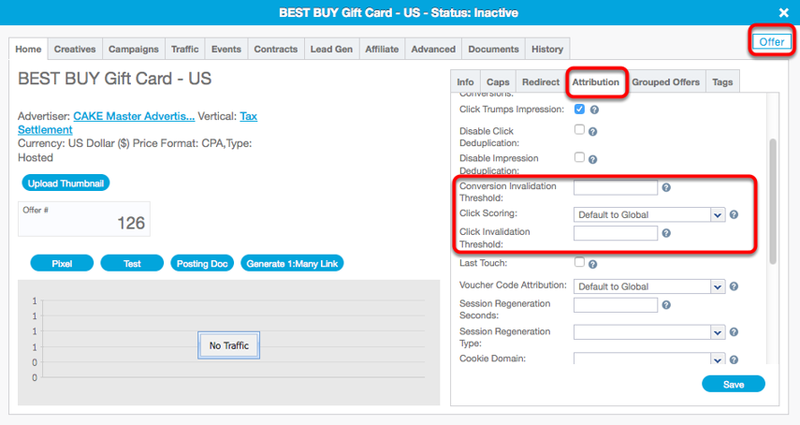 Example: Conversion Behavior on Redirect (Offer) = ‘Ignore Conversion’ and Conversion Invalidation Threshold = 60. When a Conversion occurs at or above a score of 60, that conversion would be ignored. Enter a value between 0-100 to indicate the threshold for Conversion Invalidation. 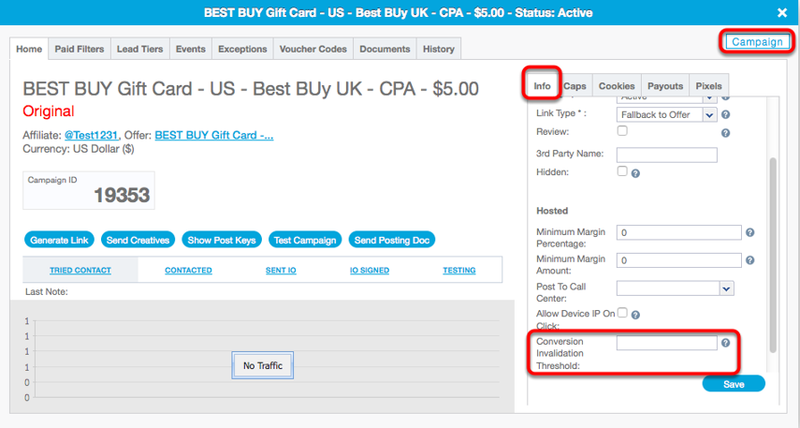 For example, entering a value of '50' would mean that all the conversions for this campaign scored at 50 or above would be handled based on the "Conversion Behavior on Redirect' configuration found on the Redirect subtab of the Home tab on the Offer Card. For Hosted offers, 'Invalidated Conversions' will be sent to the Review Queue. 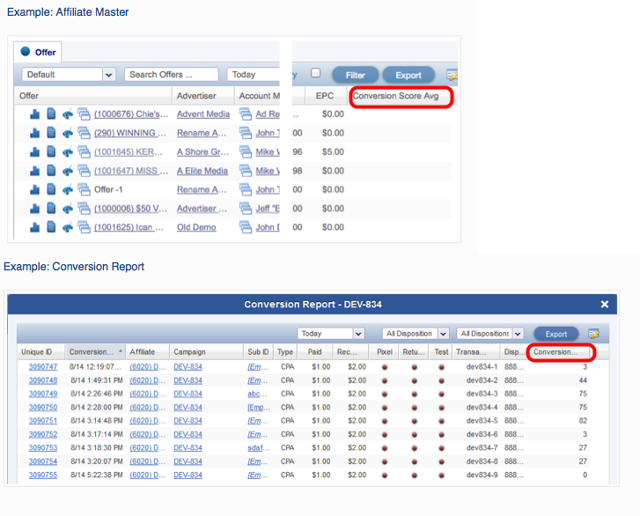 For Host-n-Post offers, 'Invalidated Conversions' will be Rejected. Create Rule Targets based on Click Score. Simply enter the minimum and maximum score values to redirect traffic that falls within that range. You can setup multiple targets based on different scores ranges. •Following CAKE’s typical hierarchy, the Conversion Invalidation Threshold is evaluated on the Campaign first, then the Offer. For example, if a Campaign level threshold is 90, and the Offer is set to 80, a score of 90 and above would trigger the Campaign Redirect (unless none is set). A score below the Campaign Threshold would trigger evaluation at the Offer Level. Or, if a Campaign involves a questionable publisher, a client may set the Campaign Threshold very low, indicating a low tolerance for risky conversions, while setting the Offer Very high, indicating that some risk is palatable. 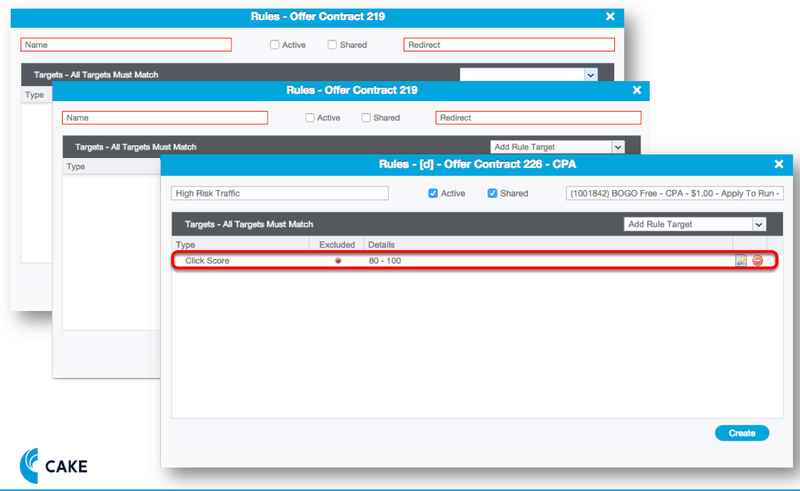 –CAKE first evaluates the Offer Level configuration, “Click Invalidation Threshold”, determining if a click score for that Offer was exceeded. Normal redirection hierarchy. –CAKE then evaluates any ‘Click Score’ Rule Targets. For example, if I have set the Offer to 80, and a rule Target for a range of 65 – 79, we will first evaluate the click against the 80, then the Rule. Reminder, there is not a Campaign level override for Clicks, only Conversions. Conversion Score Average – This is the average fraud score based on the aggregate number of scored conversions. So, if I had 2 conversions, a fraud score of 0 and 50, the Conversion Score Average would be 25. Conversion Score – This is on the Conversion Report and shows the individual fraud score from Forensiq . High Risk Conversions - When a conversion's risk score falls between 80-100, we mark that conversion as high risk. Note: The Forensiq fraud scores will be updated by batch. This means that while the CAKE conversion is recorded and displayed in real time, the fraud score updates occur on 10 minute intervals. As an example, you may have 10 conversions logged that should reflect fraud scores. 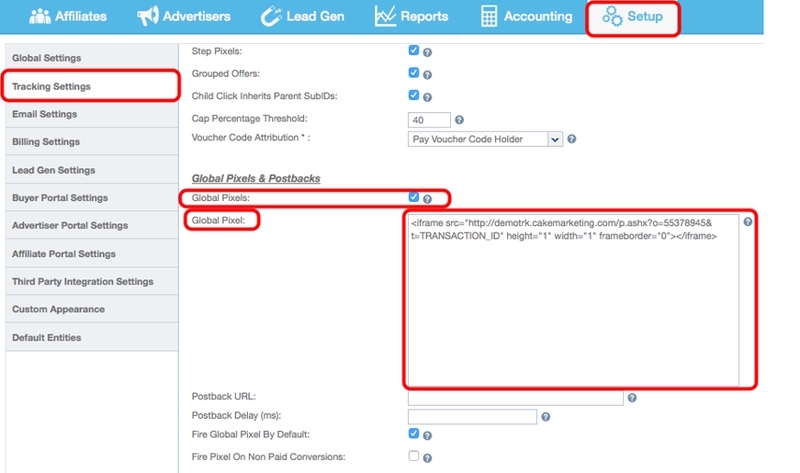 These 10 conversions will be displayed in the various reports in real time, but the fraud score column will display “Not Processed”. On a running 10 minute interval, those 10 conversions will be updated via batch API call and scores updated. When a conversion's risk score falls between 80-100, we mark that conversion as high risk. This column is off by default and can be enabled through custom views. From the Affiliates/Advertisers> Stats> Technology> Fraud Disposition you will be able to see a Fraud disposition breakdown across conversions for a given date range.